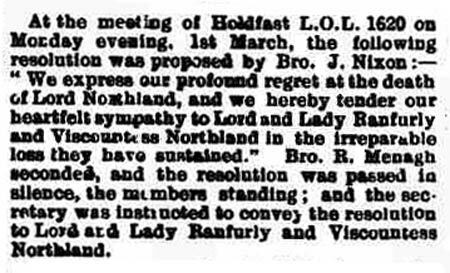 At the meeting of Holdfast L.O.L. No 1620 on Monday evening, 1st March, the following resolution was proposed by Bro J Nixon. 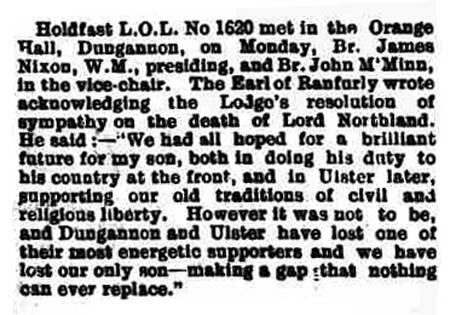 :- �We express our profound regret at the death of Lord Northland, and we hereby tender our heartfelt sympathy to Lord and Lady Ranfurly and Viscountess Northland in the irreparable loss they have sustained.� Bro R Menagh seconded, and the resolution was passed in silence, the members standing; and the secretary was instructed to convey the resolution to Lord and Lady Ranfurly and Viscountess Northland. Holdfast L.O.L. No. 1620 met in the Orange Hall on Monday, Bro. James Nixon, W.M., presiding, assisted by Bro. McConnell in the vice-chair. 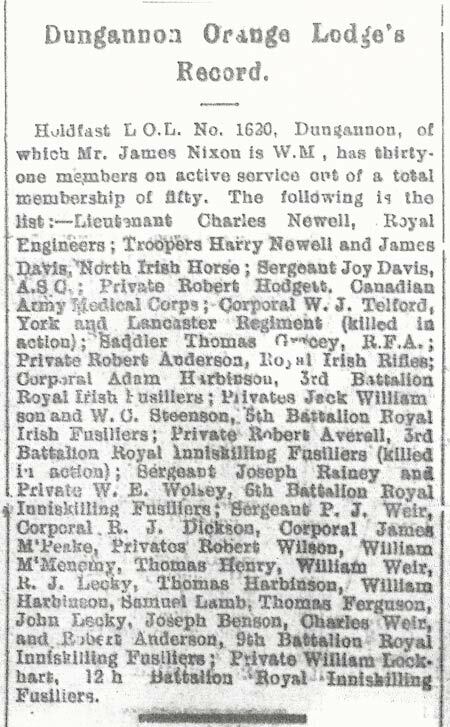 The secretary reported that twenty-six of their members were at present in the army. 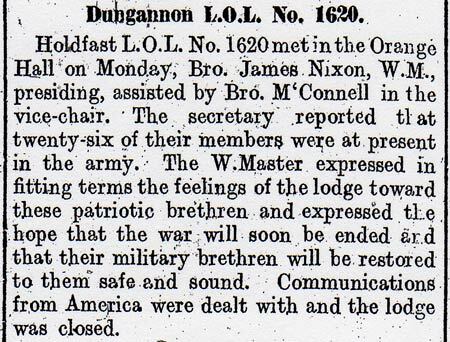 The W. Master expressed in fitting terms the feelings of the lodge toward these patriotic brethren and expressed the hope that the war will soon be ended and that their military brethren will be restored to them safe and sound. Communications from America were dealt with and the lodge was closed.